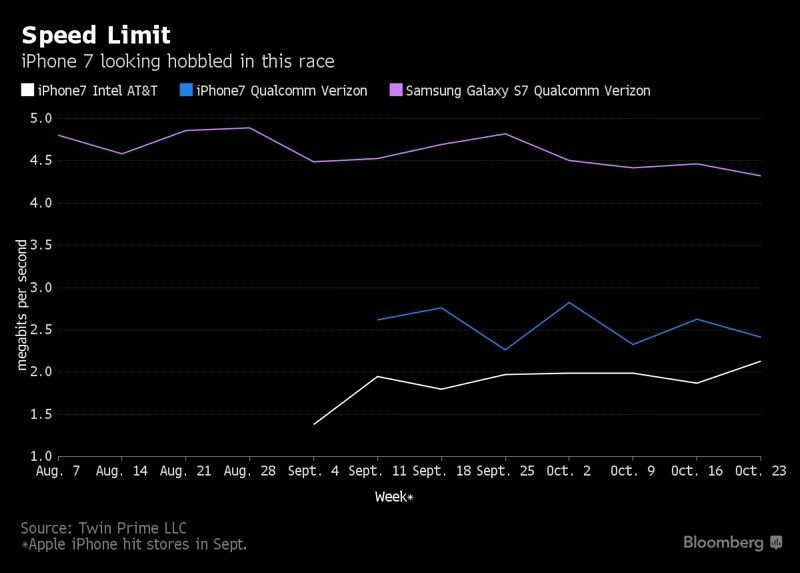 Apple may be throttling the LTE performance of the Verizon iPhone 7 to keep it on par with the AT&T iPhone 7, according to research conducted by Twin Prime and Cellular Insights and shared by Bloomberg. Based on testing, the Verizon iPhone 7 performs about as well as the AT&T iPhone 7, but it does not reach the data transfer speeds that it is capable of hitting. The Verizon (and Sprint) iPhone 7 models use different LTE hardware than the AT&T (and T-Mobile) iPhone 7 models, adopting a Qualcomm LTE modem instead of an Intel LTE modem. The hardware from Qualcomm is capable of maximum theoretical download speeds of 600Mb/s, while the Intel LTE modem tops out at 450Mb/s, but the Qualcomm-equipped Verizon iPhone 7 is only marginally outperforming the AT&T iPhone 7. Researchers believe Apple may be hobbling the Verizon iPhone 7 by not taking advantage of "a crucial component," thereby ensuring all models of the iPhone 7 perform at a similar level. Field tests suggest the Verizon iPhone 7 is just a "little faster" than the AT&T iPhone 7, but not as fast as it could be. Tests were conducted by comparing iPhone 7 performance on the Verizon network to a Samsung Galaxy S7, which also uses the Qualcomm X12. Data collected from more than 100,000 phones downloading the same image indicates the S7 was twice as fast as the iPhone 7. In a statement, an Apple spokesperson said there is no discernible difference in the wireless performance of any of the iPhone 7 models. "Every iPhone 7 and iPhone 7 Plus meets or exceeds all of Apple's wireless performance standards, quality metrics, and reliability testing," Apple spokeswoman Trudy Muller said. "In all of our rigorous lab tests based on wireless industry standards, in thousands of hours of real-world field testing, and in extensive carrier partner testing, the data shows there is no discernible difference in the wireless performance of any of the models." Though the two phones are performing on a similar level, past testing by Cellular Insights suggests that changes somewhat when signal strength is an issue. In areas of weak reception, the Verizon iPhone noticeably outperforms the AT&T iPhone by maintaining a stronger connection and enabling faster low-signal transfer speeds. Other network testing companies that Bloomberg contacted said that reliably measuring data transfer speeds is difficult due to the many factors that can affect performance, but the information collected from Cellular Insights and Twin Prime was not disputed. Dammit Apple, everyone loved it when you made one identical phone for all carriers. Android does this with many of their phones, why are you going in reverse? The optimist in me thinks this isn't true. Then I stepped into reality, stared Tim Cook in the eye, and knew more emojis were on the way. Bad news from Apple and about Apple products just continues and continues. Cellular Insights is a shell company created in 2016 by Qualcomm to FUD Intel broadband chips. That is all they have been doing, and people are eating it! Who is paying these "studies" after all? Who pays Cellular Insights? Where they get their money. Why did they only appear in 2016, when Apple is using Intel modems? Also, Qualcomm is the #1 supplier for top of the range SOCs and modems for Android phones. So you just defend Apple no matter what? Apple is infallible and no one could possibly have a legitimate complaint? So many great news for Apple! Apple's spokesperson's statement says nothing to deny they are throttling performance. Spreading the bad news to a new product line. If I could get to 450Mbps I would take that. Fastest I have seen personally is about 90Mbps and that was only once. On average I see 40-50 so 450-600 is of no concern at this point.